Honey Candles - 100% Beeswax Heritage Drip 5"
Home / Honey Candles - 100% Beeswax Heritage Drip 5"
Honey Candles Honey Candles - 100% Beeswax Heritage Drip 5"
Each Dripped Pillar is unique with no two the same. 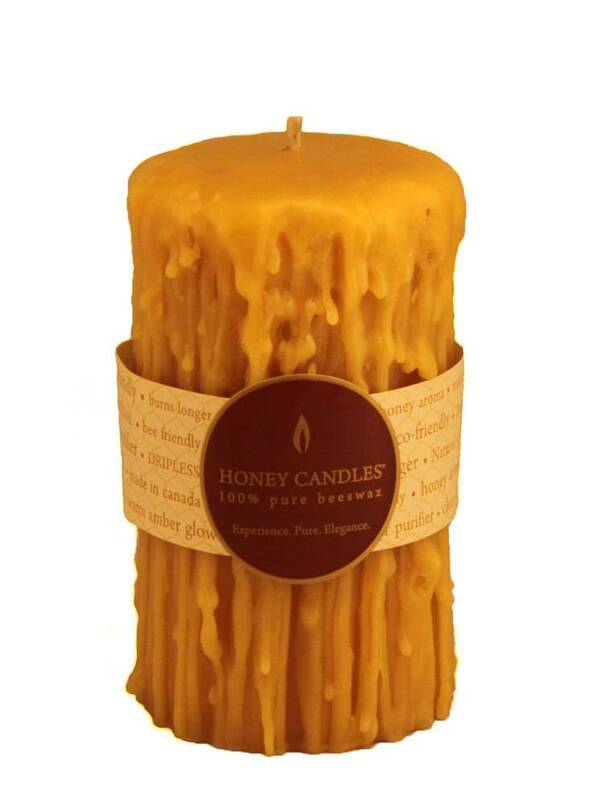 Handmade with 100% pure Canadian beeswax, Honey Candles® 5x3.25 Heritage Drip Natural Pillar produces a soothing warm glow and a delightful natural scent that burns for hours and hours. The 5x3.25 Heritage Drip Pillar is eco-friendly and good for your health, with absolutely no carcinogens or hazardous ingredients, wicks made with cotton, and all natural ingredients. Better yet, beeswax pillars produce unique compounds as they burn, which neutralize airborne allergens and toxins. You'll quickly breathe the difference pure beeswax candles make. Plus, beeswax candles produce a natural glow that very closely resembles sunlight.